SEI Packrafting FMP - S.E.I. Whether for SAR / Extraction or recon, hone your skills with this challenging course. Ascend through the mountains and descend on the rivers. Packrafting is another means&nbsp; of Alternate Insertion Extraction through varied riverine terrain.&nbsp; A packraft is an inflatable one-man raft that packs up into a small, five pound package that can be strapped to a rucksack. The S.E.I. 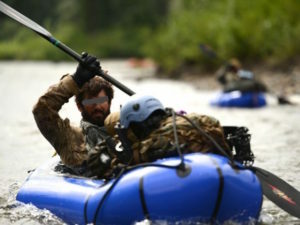 packrafting Course Of Instruction will spend time moving through mountainous terrain, land/ATAK navigation, field crafts, and other SOF survival skills.&nbsp; After a team movement of 1-3 days, we will inflate packrafts and river navigate both flat and white water, completing a round-trip RTB. While navigating the river, team will practice swift water skills, water hydrology, and how to properly manipulate raft and paddle efficiently. With my climbing rope skills and my passion for moving water, I jumped on the fast track to become a rescue instructor. That was a little more than 25 years ago and I am lucky enough to still be traveling the world teaching today. I became an EMT in 1991, Firefighter/EMT in 2003. I have a Rescue Educator Foundation Degree from the University of Central Lancashire. I am a Rescue 3 International Instructor Trainer for Rope, Water, Rescue Boats, PWC as well as an American Canoe Association Instructor Trainer Educator for Safety & Rescue and Rafting. I have also taken more FEMA courses than merit mentioning. With this and more, I hope I get to share my training and life experience with whomever is interested. I have also worked with many of the elite DoD teams.